I'm not usually a die hard American Idol fan, really I'm not. I know as you're reading this you won't believe me, but in the past, I could care less. I never voted until this season. Even now, I wouldn't consider myself "die hard". ALTHOUGH, I do want to write a post about my favorite contestant now that things are getting down to the nitty gritty. I'll list them in order of my favorites. Okay, so now let's move on to the rocker, David Cook. I'm going to be flat out honest. I like his songs, I really do. He makes all of his performances unique and he has a special charm to his face when he sings. He's not like most stupid rocker boys who really CAN'T sing and just scratch their voice to sound cool. He CAN sing. Kora is in love with him since she saw his Phantom performance so he has her vote from here on out. The bad side? I'm worried he's going bald under that hairdo and is doing the comb forward to cover it up. Something about his skin coloring makes me nervous like he might stink or something. He always looks a little TOO greasy. He's in my top two because he interests me, but I'd be a little disappointed if he won. Idol has already spawned a rocker from past shows, I'm ready for something new this year. The next two I'm going to combine. Brooke White and David Archuleta seem to be like brother and sister or something. Maybe it's because they're both Mormon and my brain automatically puts them in the same category, I dunno. Brooke is cute, but annoying to me. I can't tell if she's sincere in her humble personality or just being fake to try to get more votes. She's off and on with her performances so based on just that, I don't like her. In the beginning she was interesting, but I'm bored now. She's too old. David was super cute in the audition part of Idol but he's LONG out-stayed his welcome. How do you market a singer like himself? He's the same thing, over and over and over again. He's just a younger version of Bryan Adams and will never be an "American Idol" if you ask me. If he wins, he'll be like all the other loser winners who never did anything with themselves except win. His voice bugs me, he needs to clear the phlegm out of his throat of something. He seems sneaky too, like he has a secret. Do you get that when you see him just standing there between commercials? Weird. SOOO, if you have unlimited texting like me...VOTE FOR JASON CASTRO!!!! 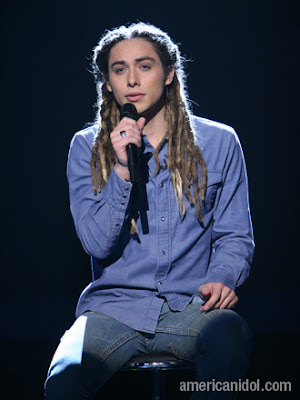 And if you DON'T have unlimited texting then, VOTE FOR JASON CASTRO (at least once!) Support my hometown and the BEST and most unique performer on Idol this season! You won't be sorry!! I LOVE jason castro. he's so sweet and tender and i love the sound of his voice. I've never been a die hard fan either (not voting) but this year i've started to vote (well a little bit at least) and it's all because of Jason Castro and David Cook. I wouldn't mind if David Cook won. I really like him.